One For Me, One For You Giveaway! Are you seeing double? Good! 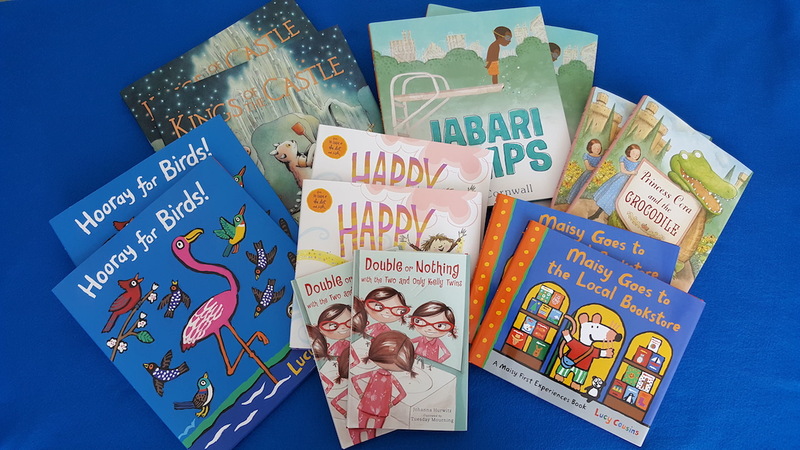 Because for this fantastic finale to Teacher Appreciation Week, you could win a set of books for yourself and a second set for a teacher friend! Yes, indeed. We’re giving you a giveaway that allows you to do your own giveaway! I love it! What would you like to have more of in your classroom? Be sure to do this before midnight on Sunday, May 14, 2017. I’ll announce the winner right here on the blog, and I’ll also notify the winner at the email address used to submit the comment. I hope you had a fabulous Teacher Appreciation Week! Update: The winner of our “One for Me, One for You” giveaway is MH, who posted comment number 21! Congratulations! I would like to have more help in the classroom and matching colorful bins for all of my books! Chocolate is always nice, but 15 minutes of uninterrupted time would be fantastic. Honestly, I would like more ink for my classroom printer. My students respond better to color, but it costs!! The uninterrupted time to complete a project would be great! More TIME ….. with some time to allow the students to express themselves creatively. Seems like we are hyper-focused on curriculum and there is no time for creative expression. Thanks for supporting teachers – Mailbox is THE BEST! Classroom helpers with a strong work ethic! Magic! …..More specifically…. Magic that can pick up all of the little scraps of paper after we are done practicing using our scissors!! A good stapler that doesn’t jam! I would like a magic fairy that fixes all the iPad issues before the kiddos bring them up to me!! Glue sticks! We always run out of glue sticks for projects. Chocolate/time are also helpful. A classroom with enough variety of books to match every reader’s desire. Tape- clear, masking, colorful duct, painters!!! I need it ALL!! 5 extra minutes to use the restroom! I need some uninterrupted quiet time to fill out all of my special education paperwork. I would like to have more time with my students so I can give them all the information they need to do there research. I would like more sensitive and experienced classroom helpers along with MORE chocolate! I’d love to have more time, more help, and more money for activities. I would like to have an endless supply of glue sticks in my classroom. I would like more age appropriate puzzles. Staples. I never have enough. Glue sticks, we always need more glue sticks! I would like to have more iPads so that my students would not have to share 5 iPads between 20 students. Of coyrse I would love to have lots of chocolate. open our windows like an inch because of the child locks on them. Tape & other fasteners, but also I want an unobtrusive way to play soft background ‘brain music’ without the sight of a player. I would love to have a classroom. I am an itinerant ESOL teacher, and I travel from school to school. I would love to have coffee and bottled water in my car, though! I would love to have some extra help in the classroom. I teach half day Kindergarten. If no parent shows up to help with the folders, taking out homework and putting in new homework, I waste teaching time to have the students put their things in themselves. Fridays are the worst!!! Dark chocolate, please! And new dry erase markers…ours are all drying up at the same time. Definitely more time to get things done! Five minutes of uninterrupted silent learning. I would love to have more books for my classroom library and maybe more math manipulative. More time to spend on teaching – rather than all the other stuff that eats away instruction time! Time. There’s simply not enough of it in a day to do all the things I’d like to do with my kiddos. TAPE!! Why is it you can never find a roll when you need it! pencil sharpeners that work, and time. More chocolate of course! But for my classroom…a reliable printer would be great! I would like more classroom helpers for sure. Closet space for more art materials! I would love to have more technology- Ipads or portable computers, and a SMARTbord/interactive white board. Snacks and Coca-Cola. Flexible seating, classroom helpers, laptops, printer, paper, ink- Not asking for a lot ???????????????????? There are many things, but if I had to choose one I would say books! I would like to have more time to build relationships with students and spend more one on one time to help children be successful with their learning. It seems like their is not enough time to do everything that is crucial for students to succeed. Glue sticks and colored paper. The ABCs-Apple laptops, books and chocolate! More storage would be great! I would love to have more time.It never seems like there is enough of it- especially when you do an A.M and P.M session. More help would help too. As my mother taught me- many hands make light work! I have a retired teacher who volunteers, two days a week, in my classroom. I would love another volunteer with Ms. Kathy’s skills. Parent helpers. Even one would be nice. I desperately need the glue stick fairy to visit my classroom and fast! •More time to plan each week. •More time to get materials prepped. •Things such as dry erase markers and erasers. •Not to mention pencils, not the cheap kind that fall apart. •And all sizes of art and construction paper for follow through science, art pr social studies projects. But most of all I would like respect. •Respect from lawmakers who make us jump through hoops and give our school a grade based on testing, not factoring in other factors but hardly can give a good raise to combat cost of living. •Respect from Parents who think you should do it all but don’t even help at home or ever think to volunteer. If I can’t have more, I appreciate sites like this with give aways that are as a bouquet of sunshine given out as books. It’s always fun to enter and hold out hope to possibly win. I would love to have more classroom helpers. The more assistance the merrier! There’s nothing like an extra set of hands in any classroom. Essential supplies are always welcome as well as another good book! We love to read in our classroom! I would like more books for my classroom library. Im not sure what I want more of, but my nephew just answered cake, and that sounds pretty good to me! I would like to have more flexible seating and leveled books. More books and helpers to read them to the children. I would love to have more books to explore through! I would like more patience, sometimes it’s hard to find some, lol. New shelves as well as classroom furniture and media center. Storage space! But more realistically sturdy bins for my books and manipulatives which will fit nicely onto my shelves. I would love to have a projector! ???? It would be such a fun way to incorporate identification/recognition games, literacy, math…possibilities are endless ???? I would love more time to get everything done! Manipulatives, art supplies, center items, etc. Storage bins. I would like more lids. Lids to the glue sticks. Lids to the markers. Lids to glitter sticks, this is a big one. And a great assortment of books. More assistants in the classroom. I would like some updated furniture and cute storage solutions for my small room! Wish I had more space, more cabinets, and more technology! I would like to have more books and manipulates! Technology. As a reading specialist, I get 1 student iPad. The kids are doing so much with technology in their classrooms, but it’s hard to teach for transfer when you don’t have the same tools as the classroom teacher. I would like more manipulatives, books, help, and time. I would love more storage bins and organizational items. I would like more technology that worked. My students love it when they have it! Honestly I will love more learning book. I would like more options for seating in my classroom. I would like to have more dry erase markers.Between the writing center,name writing and caps left off we go thru them quickly. I also would like ipads or tablets for students. 15 minutes of alone, uninterrupted time during the middle of the day to use the bathroom, etc.! I would love more storage. And more time to organize. I would love to have more great works of literature! I would love to have more time for extra projects in my classroom. I would love to have more books and a classroom helped. I would love more one on one time with my students! My first graders are always wanting to share stories with me but there is never enough time to share them all! I would love to see more books. Books!!!!! Of course you can never have too many!!!!! People willing to help me label and organize all of the books in my classroom library. I would love to have more space! My classroom is small which limits long term projects and creativity. More technology! iPads, better computers, etc! I would love to have more computers. I would love to have more helpers! I would love more cabinet space! Working in a portable makes things tricky. Also, more time to catch up on paperwork! Definitely bigger windows, the classroom only has thin rectangular ones that are too high to reach! I would like to have more help in the classroom. At the beginning of the school year we had 8 infants from 6 weeks to 5 months of age. There were 2 teachers. It was very overwhelming at the time. I now have 4 one year olds and 4 ten month olds. I believe that the infant classroom should always have 3 teachers. I would also like an outside play area for the infant class only. Thank you for the opportunity to apply for this giveaway. Have a great day. I would love to have a window in our classroom! We are surrounded by concrete walls. Our students would love to have a little sunshine to grow in, as well as be able to watch the changing seasons outside! A double of me so, one of us could play with the kiddos and the other could do the paperwork and assessments:) Always more ti.e! More time to do art projects that are just for fun. More time to spend on teaching, less paperwork and book keeping work! coffee and so I wouldn’t have to keep walking back and forth to make copies for class work and homework packets!!!!!! LOL!!!! That would be nice!!!!! I would love to have more manipulative toys in our classrooms. We are a small center that serves several under privileged children. I want a unlimited color printing capabilities!! School supplies, laptops, educational resources and more time in the conference period. I would love more time and space. I have so much I would love to do the kiddos! Paper pocket folders, page protectors, glue sticks, thick pencils, writing paper, scissors that can really cut, and more space and more books. Oh Oh and I desk for writing in our writing center. More space in the classroom would be lovely. Headphones ! This year we have had many get broken or just stop working. Dollar tree ear buds are okay but kindergarteners have trouble with them! I would love to have more books for my class. I would love to have more STORAGE SPACE!